In mid February the US, together with their British auxiliaries, launched an assault on the town of Marjah in Afghanistan’s Helmand province. This town and the surrounding area have been in Taliban hands for several years. This operation, which US forces announced well in advance and publicised by dropping leaflets on the town, was the first major move in a new strategy following the socalled “surge” in US and NATO forces which President Obama ordered in December 2009.
enabling infrastructure development to occur. At the same time as ordering the “surge” Obama stated that the sending of the extra troops was really preparation for a withdrawal of US forces which would begin in July 2011. The announcement of the “surge” was followed by a conference, hosted by the British, which took place in London in late January. The message from this conference appeared to be that the allies were now seeking a negotiated peace with the Taliban. Saudi Arabia and Pakistan, who were represented at the conference, were instructed to bring the Taliban to the conference table so such negotiations could begin. At the same time the Afghan president, Karzai, was ordered to clean up his government by weeding out the corrupt individuals and then call a grand meeting of all the tribal elders, the famous “Loya Jirga” to facilitate a negotiated peace. NATO, meanwhile, would continue training police and army until their number was increased to 300,000, and gradually provinces would be handed back to the exclusive control of the Kabul government. NATO operations were meanwhile to continue to prove to the Taliban that they could not win militarily. It is clear from these proposals that the US and its henchmen are significantly lowering their stated ambitions for Afghanistan. All the chatter about democracy, freedom, human rights, the liberation of Afghan women, defeating Islamic fundamentalism and so on, which Bush and Blair so solemnly intoned, has fallen silent. Now the talk is only of achieving a stable puppet government which includes the Islamic fundamentalists but which can control the country with the support of US cash and a smaller military force. It is interesting to note how similar these aims are to those of the Russians when they withdrew in 1989. The Russians aimed to install a puppet government which they could hold in power by economic and limited military support. In fact they succeeded in doing this temporarily and the government they left, headed by Najibullah, was able to control the country and keep the roads open so long as it was supplied with Russian fuel, weapons and advisors but the costs proved prohibitive. Once the Soviet Union collapsed and all support ended in 1991, this government collapsed. The reasons the allies have lowered their aims are not difficult to understand. The invading forces have become so unpopular in Afghanistan with their cavalier attitude to the loss of Afghan civilian life that they are now the main recruiting agent for the Taliban. The Afghan government, which they are supporting, is utterly corrupt. Transparency International reported that it was the second most corrupt government on earth (2). It is a government which has been categorised as a coalition of war lords and drug traffickers. It is also a government which is seen as illegitimate since it quite openly rigged the election of August 2009 which gave Karzai his latest term as president. 2009 has been the worst year yet for loss of life amongst the invading forces with 520 soldiers killed. Domestic support for the war is flagging in the NATO countries, while the costs remain enormous. At a time when, for the US, unemployment stands at 10%, and there are between 2.3 and 3.5 million people homeless (3) the spending on the war appears profligate. The latest US military budget allows $130 billion for the Iraq and Afghan wars in 2010 and the cost of the surge adds a further $30 billion, while it is well known there are other hidden costs which are not monitored by the US Congress. Although the real reasons why the US and its allies have embarked on this war are always concealed, but will be considered below, the reasons given out for domestic consumption are pathetic to say the least (4). In addition these reasons are always being amended and opinion polls show they are now not generally believed. A majority in NATO countries have no idea why they are fighting in Afghanistan. NATO governments, such as the Netherlands and Canada, are threatening to pull their forces out while France and Germany remain reluctant to commit further forces. The US general in charge of operations in Afghanistan, McChrystal, declared, before the “surge” was agreed, that the war was being lost! Can the new approach succeed? Afghanistan - a Stable US Protectorate? Despite all the rhetoric, the new plan is essentially the old plan but a less ambitious version of it. The US is still aiming at creating a US protectorate in Afghanistan just as it was under the Bush administration. The lowering of the goals is, in essence, recognition of the limits of US military power and the need to reach the objective by negotiation as well as force. The weaknesses in this plan, which many bourgeois commentators have been quick to point out, are its reliance on the Kabul government and its plan to separate the insurgents from the population. The US victory over the Taliban in 2001 was achieved by backing one side in a civil war, namely the “Northern Alliance,” which was predominantly formed from Tajiks, against the Taliban government which was largely Pashtun. The Taliban were never able to consolidate power over the whole country even with the help of Saudi Arabia and Pakistan. The present government, and importantly the army, is largely made up of the former enemies of the Taliban, enemies with whom they were at war before the US invasion. Building up the army and police will inevitably mean strengthening the Tajik control of these forces. When one considers the corruption and illegitimacy of the present government, it is little wonder that US support for it is seen, by many Pashtuns, as equivalent to propping up a group of gangsters. In addition the US has extended the war into the Pashtun regions of Pakistan thereby alienating the Pashtun people on both sides of the border. The US defence secretary has equated the Taliban with Al Qaida and by implication with the Pashtun people, making the war appear as a war against the Pashtuns. Far from being a prelude to withdrawal, the US actions appear to many Pashtuns as preparations to turn the whole region into a battlefield. There are 12 million Pashtuns in Afghanistan, amounting to 42% of the population, and a further 20 million in Pakistan. At present a majority appear to support the insurgency with fighters changing from insurgents to civilians and back again in response to the ebb and flow of the fighting. The US strategy of separating the civilians from the insurgents will therefore be extremely difficult without some sea change in the perceptions of the Pashtuns. The credibility of the US is at a low ebb. Apart from killing thousands of civilians with indiscriminate bombing and shelling, it is well known that prisoners are tortured and disappear into CIA controlled black holes at Bagram, Guantanamo and elsewhere never to re-emerge. This makes the offer of amnesty appear as a cheap trick. The “surge” is supposed to be based on the Iraqi surge and its success in Anbar province. However, as has been pointed out by bourgeois journalists, the conditions in Afghanistan are quite different (5). In Iraq the Sunni insurgents had lost a civil war against the Shia militias and were prepared to turn to the US for protection from the Shias but this is not the case in Afghanistan. On the contrary the Afghan insurgency appears to be gaining ground against an increasingly desperate invader. Also by announcing the “surge” was a prelude to withdrawal in 18 months, Obama has indicated that the US has no stomach for a long war. The message which the insurgents, and their backers, get from this is that they only have to wait and the US will leave. No negotiated settlement will be possible without the support of the Pashtun peoples and at present this looks like a distant prospect. The current the position of the Taliban is that there can only be negotiations once the invaders have withdrawn, a position which is, of course, quite unacceptable to the US. The Kabul government itself clearly does not want the US to withdraw. While the last sentence shows Karzai is dead right about US intentions, Eikenberry’s assessment of his inadequacy as a US puppet is also clearly correct. The likely intransigence of the Taliban, the alienation of the Pashtun community in which the Taliban are based, and the inadequacy of the Kabul regime for the US’s purposes, mean the new US strategy will almost certainly fail. Whilst US imperialism may have altered its strategy its regional objectives remain exactly the same as they were during the Bush administration. The regional objectives of the US are to control the major energy producing regions of the world, namely the Middle East and the Caspian Basin. This means creating pliant regimes and supporting them while removing those regimes which oppose US interests. All this requires having military forces and bases from which they can operate in the region. The wars in Iraq and Afghanistan are part of this regional objective. Afghanistan is seen as the gateway to the gas and oil riches of Turkmenistan and the Caspian Basin. As we have explained in previous texts (7), the US wished to get the oil out of this region to the Indian Ocean via pipelines through Afghanistan and thereby exclude Russia and China from this energy resource. It was the Taliban’s failure to secure the entire state and permit US plans to proceed with its plans to build pipelines which prompted the 2001 invasion. The attack of 9/11 provided useful camouflage for the operation but was not its cause. Three recent developments have shown that the US regional objectives are not only unchanged from the Bush era, but are being actively pursued by the Obama regime despite all his waffle about “change.” The first is the escalation of the Afghan war which the surge clearly represents. One way or other the US intends to install a client regime in the country and have long term military bases. This is a step towards getting the oil and gas from the Caspian states into US hands. The second is the extension of the war into Pakistan which Obama has openly described as part of the Afghan war. Obama has increased the attacks on Pakistani territory by drone aircraft (8). Hundreds of people have now been killed in these attacks. In addition to the open military operations in the frontier provinces the secret operations of US troops within Pakistan itself have been stepped up. 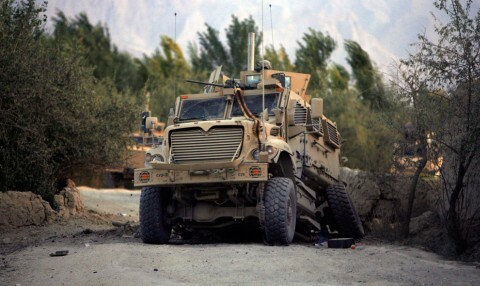 The presence of US forces in Pakistan was brought to light in early February when 3 US soldiers were killed by a Taliban bomb in the North West Frontier Province of the country. The US subsequently admitted the soldiers were training frontier guards. This is apparently part of a secret war which the US has been conducting with funds which don’t appear in the published figures for aid to Pakistan. The training of the frontier forces is part of a $400 million, previously secret, assistance programme (9). In addition the US is becoming more directly involved with advising the Pakistani army and giving it weapons. The US gave the Pakistani military $3bn in 2009 and it is reported that the defence secretary, Gates, during a visit in January, offered the Pakistan army 12 drone aircraft to use against the Taliban themselves. The third development is the stepping up of operations in the Persian Gulf and operations against Iran. The US is now directly intervening in Yemen. Its special forces are operating in the country and its drones are killing suspects in the north of the country. In February, as part of a series of moves against Iran, the US sent naval forces capable of shooting down missiles into the Persian Gulf and announced that missile defence batteries were to be installed in Kuwait, the United Arab Emirates (UAE), Qatar and Bahrain. In addition billions of arms have been sold to the US Gulf clients. The UAE, for example, now has 80 F16 fighter aircraft which, US General Petraeus boasts, would be able wipe out the entire Iranian air force. These measures are clearly designed to neutralise any Iranian counter strike following an attack on its nuclear facilities. This can only mean that a direct attack on Iran is again being considered and prepared for. The Iranian regime is still unacceptable to the US and the US aims in one way or another to change it. Why, it is often asked, is the US, which remains the only superpower, struggling to achieve its aims when its enemies are not supported by any major power? When the Russians were trying to install a client regime in Afghanistan the Islamic resistance was openly supported and armed by the US. This was the mirror image of what occurred in the Vietnam War. The development of these two wars was a general representation of the pattern of all the national struggles which took place in the period from the Second World War to the collapse of the Russian bloc. These wars were characterised by Left Communists as inter-imperialist wars, since even when the major imperialist powers were not fighting themselves they were supporting their clients thereby creating proxy imperialist wars. One of the reasons the US was so happy to charge into the Afghan and Iraqi quagmires was that they considered that in the new historical period, which followed the collapse of Russian imperialism, the pattern of the post war period could not be repeated. No other power, they argued, would dare to openly back forces opposed to the US and hence achieving their objectives would be relatively easy. Whilst it is true that no other power has dared to openly back the US’s enemies, nonetheless US rivals have found ways of frustrating US plans and indirectly supporting US enemies. There is a hidden imperialist dimension to the wars of the new period and these wars are, therefore, still interimperialist wars. In the Afghan war the main backer of the Taliban is a section of the Pakistani army the Inter Services Intelligence or ISI (11). This group do not see Pakistani interests as being synonymous with US interests. They feel they have been double crossed by the US and sacrificed for wider US interests. They are particularly unhappy with US support for India and Indian involvement in Afghanistan, particularly in training the Afghan army. They see the old alliance with China as more advantageous to Pakistani interests. Pakistan is therefore in the classic, but dangerous, position of playing off one imperialist power against another while accepting favours from both. The Taliban is Pakistan’s pawn in this game. In the regional theatre both China and Russia fully understand US aims as being to exclude them from the energy resources of the Caspian and the Gulf and have formed the “Shanghai Cooperation Agreement” as a counter to US penetration into Central Asia. They are quite happy to see the US mired in Afghanistan, while they set about building pipelines to take the Caspian gas and oil to the north and the east. The Afghan war has therefore an inter-imperialist dimension. It is a similar story in the Middle East where Russia and China are excluded from the areas dominated by the US and the US is attempting to freeze these powers out of Iraq. China and Russia have gravitated to Iran where they have been given enormous oil and gas contracts to the detriment of the US. US attempts to change the Iranian regime via sanctions or through a direct military attack are made more difficult by diplomatic support for Iran at the UN. Russia continues to assist Iran with its civilian nuclear power programme and sells the country weapons systems while China is negotiating to build pipelines to take Iranian gas and oil east via Pakistan. These moves clearly undermine US attempts to isolate Iran (12). The struggle in the Gulf, therefore, also has a clear inter-imperialist dimension. Obama’s escalation of the war is opening another bloody chapter in the struggle for control of the energy resources of Central Asia. The surge will not end the war; rather it will lead to more death and destruction. The irony of awarding Obama a Nobel “Peace” prize at more or less at the same time as he was extending the Afghan war shows the depravity of bourgeois society (13). In his acceptance speech he sang the old refrain of all imperialist powers since the dawn of class society, namely that “war is the road to peace.” Although he was extending the war, he argued, this would lead to peace and the capitulation of the enemy. Obama is the new face of US imperialism but is pursuing precisely the same objectives as Bush. No one should be surprised at this since the objectives of US imperialism are determined by the needs of US capitalism, in particular competitiveness and its profitability. These are needs determined by the infrastructure of US capitalism, needs which the political superstructure can only reflect. Politicians are put in place to express the needs of the capitalist infrastructure and there is no essential difference between bourgeois politicians. The differences are cosmetic. While all the peace prizes are being awarded and the pretty speeches are being made the imperialist juggernaut, which capitalism has spawned, slouches on wreaking destruction and death across countries, leaving a trail of ruin and misery in its wake and always, always demanding more sacrifices and more victims. As we have shown above the wars in Afghanistan and Iraq are interimperialist wars. The only adequate political response of communists to inter-imperialist wars is the adoption of the politics of revolutionary defeatism. give solidarity to workers from the opposing side in their struggle against their own bourgeoisie. The orientation of this policy is towards turning the imperialist war into a civil war and the overthrow of bourgeois power. This was the policy adopted by the Bolsheviks during the First World War which was a decisive step towards the October revolution. Much of what is generally called the “left” give support to the enemies of US imperialism. They argue that the major imperialism must be defeated before workers can struggle for their own class interests. Workers interests must therefore be subordinated to the bourgeois interests of the nation. Thus groups such as “Hamas” in Gaza, “Hezbollah” in Lebanon and the “Taliban” in Afghanistan receive the “left’s” support simply because they are fighting the major imperialist power. The utterly reactionary nature of these political forces is not the real issue. The real issue is that these groups are proxies of imperialism and by supporting them the “left” reveal the essential bourgeois basis of their politics. Their support represents support for the imperialist powers opposed to the US and therefore support for the continuation of imperialist war. The losses of one imperialist power can only represent the gains of an opposing imperialist power and both powers stand firmly for the continuation of capitalism and against the interests of the working class. While we recognise that the Iraq and Afghan wars are skirmishes rather than full scale imperialist conflicts, and the prospect of turning them into civil wars is remote, it is still essential that communists oppose these wars on class lines and orient their opposition towards the destruction of capitalist society. Imperialist war is the direct result of the capitalist system of production and can only be ended by the overthrow of capitalist production relations. Actions of workers for their own class interests, especially when these disrupt the war plans of the bourgeoisie, are the seeds which can lead to real class opposition to imperialist war and the construction of a higher form of society. (1) The Russians had approximately 120 000 troops in Afghanistan at the height of the war. (2) See Transparency International report 17/10/2009. (4) We are told the war was to defeat Al Qaida, to install democracy, to make the streets of London and New York safe, to liberate Afghan women, to defeat Islamic fundamentalism etc. (6) Quoted in The Guardian 27/01/2010. Eikenberry opposed the “surge” and these e-mails were leaked to give weight to his views. (8) In one day 2/2/2010 drones fired 17 missiles at targets in North Waziristan province of Pakistan. Independent 4/2/10. These attacks represent assassinations of “suspected enemies” without any due process of law, supposedly a part of our famous “values”, values for which we are always being told we are fighting. They kill hundreds of people who happen to be where the US thinks the suspect might be. They cannot be categorised as anything other than state terrorism and the fact that they are presented as part of a “war on terror” is another illustration of the shameless hypocrisy of US imperialism. (9) See The Independent 4/2/2010. (11) It was interesting to note that at the London conference the Pakistanis were being called upon to bring the Taliban to the conference table. This is a clear recognition that the Pakistanis are the gatekeepers of the Taliban. (13) See leftcom.org articles/2009-10-14/%E2%80%9Cwaris- peace%E2%80%9D-on-the-award-ofthe- 2009-nobel-peace-prize-to-presidentobama or send a stamped addressed envelope to our London box for a free copy of our broadsheet Aurora for our initial comment on this.